The nigh-on impossible games seem to be making a comeback, with such titles as Super Meat Boy paving the way to the new generation. But many years ago these games were commonplace, with a particular series responsible for many curse words and hair-pulling. This series is Ghosts’n Goblins, sadly sort of forgotten by Capcom. 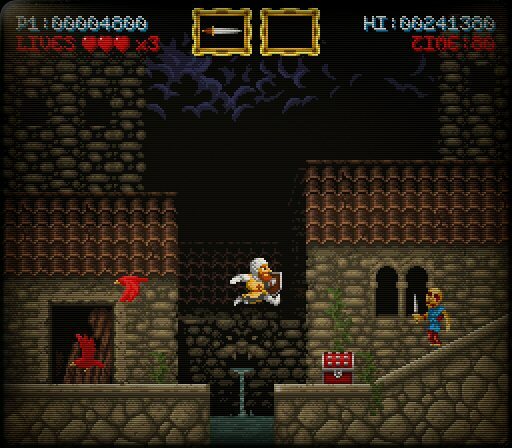 But Locomalito decided to revive the franchise with Maldita Castilla, a game with no real connection to but clearly inspired by Ghosts’n Goblins. The look is there, as so is the extremely high difficulty, but it’s a fair game at all times. Best of all, Maldita Castilla also includes the high quality of Ghosts’n Goblins and is an incredible free game for your PC. Well, not everything is exactly like in the Capcom’s series, since our brave knight doesn’t lose his clothes when he takes a hit from an enemy – you won’t see him fighting zombies and ghosts in his boxers, but he loses his new and more powerful weapon when he’s hit. Maldita Castilla demands an overwhelming persistence and patience to progress and learn where the enemies are coming from and what kind of attacks they have. Things become even more complex when we know that Locomalito included some tough and resourceful bosses. Luckily, our character will be able to pick up some new weapons and power-ups. Maldita Castilla is a game that was made available for free but ranks as one of the best indie games of 2012. It could easily be featured in Steam, PSN or Xbox Live, but luckily for us, it’s here for everyone to play. If you enjoy it – and you definitely will – don’t forget to donate to its author.